Cycling club. Wheely well done Pat. Ger Finn, Tadhg Murphy, John Carey, Willie McCarthy. cyclists who took part in the cycle. made feel welcome to our club spins and we cater for all levels. Registration evening to join our new underage cycling club. Wednesday 14th September at 6.30pm. Cyclists met at the car park next to Kilmallock Cycles and 2 groups cycled off training for 50kms and 35kms. Out enjoying cycling and wheely having a great laugh on our bikes were Jerry Ryan, Ger Finn, John Carey, Mike Sexton, Paul Gammell, David Walsh, Willie McCarthy, Shane O’Brien, Paul Finn, Donal Kelly, Ber Gammell, Michelle Gammell, Jan Murphy, Noreen Ryan, Aileen O’ Leary. Well done. Super Saturday Training 17th September cyclists met at the car park at the earlier time of 8.30pm as Ireland were playing Australia in World Cup Rugby and they wanted to be back to cheer on Ireland. Great spin in wet weather. Sunday 18th September Cyclists left the car park at Kilmallock Cycles at 8.30am and enjoyed a leisure training cycle in one group. Well done to Paul Gammell, Stephen Finn, John Carey, Michael Gammell, Shane O’Brien, Mike Sexton, Martin Lake, Jerry Ryan, Stephen Heire, Donal Kelly. Sean Burchill through his cycling efforts has raised thousands of euros for charity this year and for the NCBI National Council for the Blind of Ireland. Sean cycled 400kms in the 4 City Cycle Challenge over four tough days cycling in wet and windy conditions, Sean suffered on his bicycle for charity, so others don’t have to suffer. Congratulations Sean on another great cycling challenge for charity. Our cycling club are wheely proud of you Sean. Well done. New SWW Club cycling helmets have arrived and can be seen in Kilmallock Cycles. Southside Wheely Wheelers Ladies and Gents Club Helmets. Southside Wheely Wheelers Club Cycling Helmet. Saturday 10th September. The An Post Rebel Tour Cork city. It was an early start for our club cyclists leaving Cork CIT on their bicycles at 9.30am and cycling 150kms and 80kms along the beautiful west Cork coast over some challenging hills against strong winds but was a great way for our club cyclists to finish the last of the An Post series of leisure tours. Wheely well done to Gerard Finn, Pat O’Donnell, Daithi Creedon, Stephen Finn, Owen Tobin, Stephen O’Meara, Tadhg Murphy, Ber Gammell, Willie McCarthy, Janette Murphy, Michelle Gammell, Phyllis Richardson, Liz Leonard, Mary McCarthy, Marie Hartnett, Jonathan Moloney, David Walsh. Saturday 10th September Congratulations to our female club cyclist Aileen O’ Leary who completed the Achill Roar on Achill Island completing the Swim 400m or Kayak 1300m, Run 8 Km, Cycle 22 Km in 02:06:51 Great time Aileen, wheely well done. Sunday 11th September Club cyclists took part in the Bruff Fun Cycle 100kms and 40kms. Well done to our cyclists who took part especially after taking part in the Rebel Tour on Saturday. Well done. Super Saturday Cycle and Sunday Cycle. Saturday 3rd September cyclists gathered for the Super Saturday Cycle at 9.30am. Group was led by Sean Burchil for a leisurely cycle at a steady enjoyable pace. Enjoying cycling over 2 climbs to prepare for the Rebel Tour in Cork next weekend. Out wheely enjoying cycling were Janette Murphy, Sean Burchill, John Swords, Jerry Ryan, Leslie Radcliff, Liz Leonard, Mary McCarthy, Jonathan Moloney, Denis Keating. Sunday 4th September Sunday training cycle. Sunday cycle was brought to you by the letter W, wild, wet and windy. Autumn has arrived in earnest and made cycling conditions even more challenging. Cycling in to horizontal rain couldn’t dampen their enthusiasm for Sunday cycling. Cyclists cycled from the car park in Kilmallock to Kilfinnane, over the Balintubber climb to Ballylanders, Galbally over the Glen of Aherlow climb by the steep hotel road and cycling down in speed to a very quite Tipperary Town as they were all gone up to Dublin for the All Ireland Final and cycled on to Knocklong and home. Out cycling the 80km were Owen Tobin, Michael Gammell, Stephen Finn, Brendan Houlihan, Willie Houlihan, Stephen O’Meara, David Walsh, John Carey, Mike Sexton, Shane O’Brien, Jerry Herbert, Pat O’Donnell. Great stuff lads, wheely well done. Sean Burchill through his cycling efforts has raised thousands of euro for charity this year and the NCBI National Council for the Blind of Ireland. Sean once again is back on his bicycle for the NCIB charity and is cycling the 4 City Cycle Challenge 7th to 10th September. 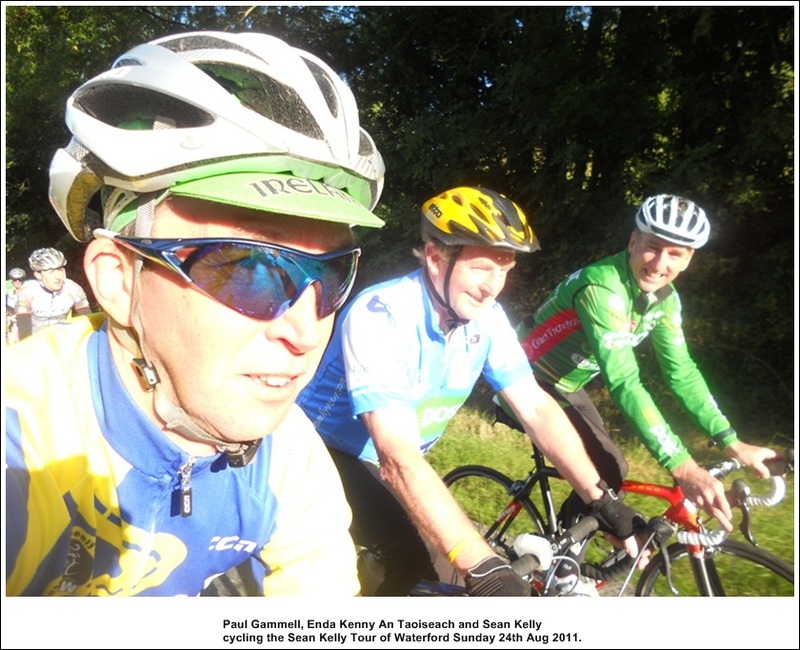 4 Cities – 400kms – 4 Days: cycling from Dublin, to Galway, to Limerick and Cork for NCBI. Sean will suffer on his bicycle for charity, so others don’t have to suffer. Best of luck to our SWW club chairman, Sean Burchill. Wednesday 31st August large crowd gathered at 6.30pm in the car park next to Kilmallock Cycles and left at 6.30pm sharp as the evenings are closing in fast and now dark at 8.30pm. The gents group cycled to Bruree, Rockhill, Ballagran, Castletown and had fun cycling a circuit with 3 hills and then on to Bruree and back to Kilmallock. The ladies group cycled from Kilmallock, Bruff, Hospital, Knocklong and back to Kilmallock. Wheely well done great training. Out enjoying the cycling were Brendan Houlihan, Tim Mulcahy, Willie McCarthy, John Crowley, Liam Duggan, Michael Gammell, Tadhg Murphy, Gerard Finn, Sean Burchill, Shane O’Brien, Jerry Ryan, Owen Tobin, John Carey, David Walsh, Donal Kelly, Mike Sexton, Jan Murphy, Michelle Gammell , Ber Gammell, Marie Hartnett, Leslie Radcliff, Aileen O’ Leary, Noreen Ryan, Paul Gammell, Jonathan Moloney.